Did you get an ORA-00936: missing expression error? Learn what it means and how to resolve it in this article. Cause: A required part of a clause or expression has been omitted. For example, a SELECT statement may have been entered without a list of columns or expressions or with an incomplete expression. This message is also issued in cases where a reserved word is misused, as in SELECT TABLE. Action: Check the statement syntax and specify the missing component. So, in summary, the query is missing some clause that it needs in order to run. The ORA-00936 error often occurs when you leave out the columns in the SELECT clause. This is because you need to list the column names after the word SELECT and before the word FROM. This error can also occur if you don’t have a FROM keyword in your SELECT statement. There is no FROM clause in this query, so you’ll get an error. Correct the query to add the FROM clause, so it knows which table to query. Sometimes you have all of the right keywords, but you’re still getting the ORA-00936: missing expression error. The reason for this is because there is a comma after the final column “last_name”, and then there is the FROM keyword. Commas should only be used when you want to specify another column or table, and not before a keyword like we have in this example. To correct it, remove the comma. Check there are no extra commas where there shouldn’t be. Just like the UPDATE statement, you can also get an ORA-00936: missing expression in an INSERT statement. Check that you have all of the required keywords. 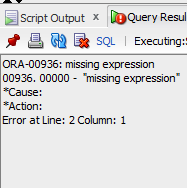 So, that’s how you resolve the ORA-00936 error in your SQL query. If you have any questions on this error, leave a comment below.